Your Beldray steam mop works hard to keep your house sparkling, so help it to work at its best by replacing the mop head pad every so often, or after an especially tough clean. These mop pads are suitable for use with BEL0013 1500W Pump Steam Mop, BEL0165 1500W Steam Mop and BEL0186 1500W Steam Mop, which can be used to clean beautifully with no chemicals. Made from soft polyester, these durable microfibre mop pads lock in dirt so you can clean efficiently and hygienically on any floor. A pack of 2, these mop head pads are designed to refresh your mop head so it can continue to clean and sanitise your floors. 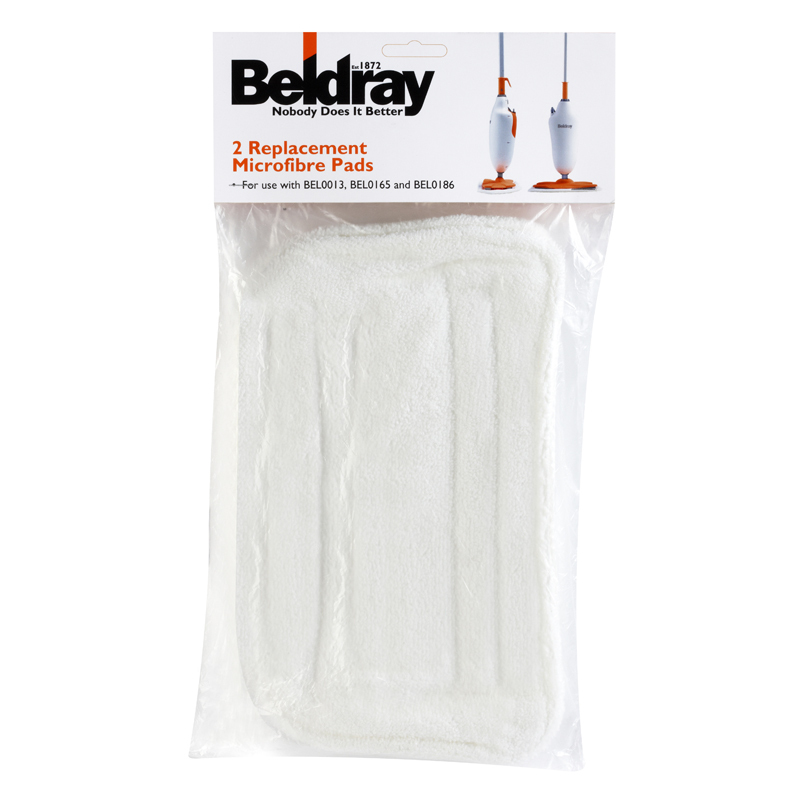 These mop pads are designed for use with the following Beldray steam mops; BEL0013, BEL0165 and BEL0186, to make them feel like new. The microfibre pads pick up and lock in dirt, containing it rather than pushing it around the floor, guaranteeing an effective clean. Suitable for carpets, rugs and hard floors, microfibre cloths are non-abrasive so do not worry about scratching any surfaces. Microfibre cloths, used with Beldray steam cleaners, enable chemical-free cleaning with brilliant, streak free results with no residue.